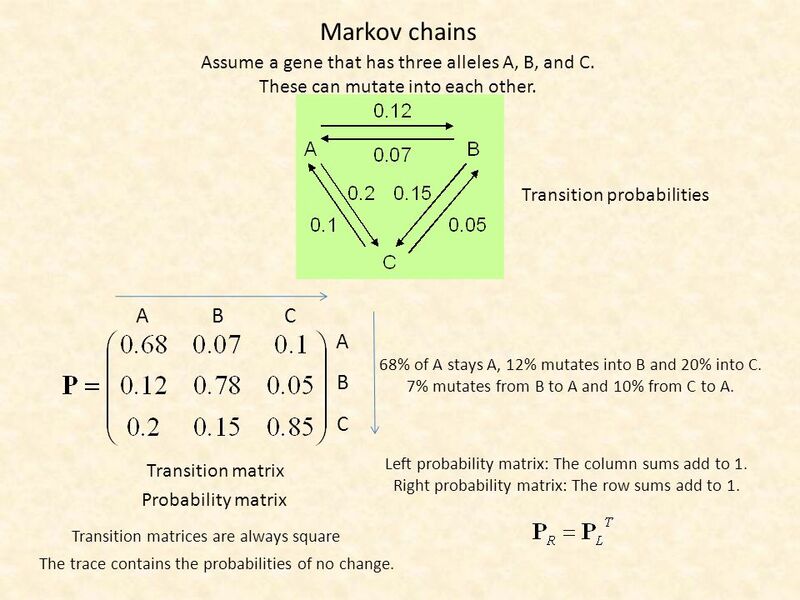 Markov chains Assume a gene that has three alleles A, B, and C. These can mutate into each other. Transition probabilities Transition matrix Probability. 1 Markov chains Assume a gene that has three alleles A, B, and C. These can mutate into each other. Transition probabilities Transition matrix Probability matrix Left probability matrix: The column sums add to 1. Right probability matrix: The row sums add to 1. Transition matrices are always square The trace contains the probabilities of no change. A B C A B C 68% of A stays A, 12% mutates into B and 20% into C. 7% mutates from B to A and 10% from C to A. 3 Assume for instance you have a virus with N strains. 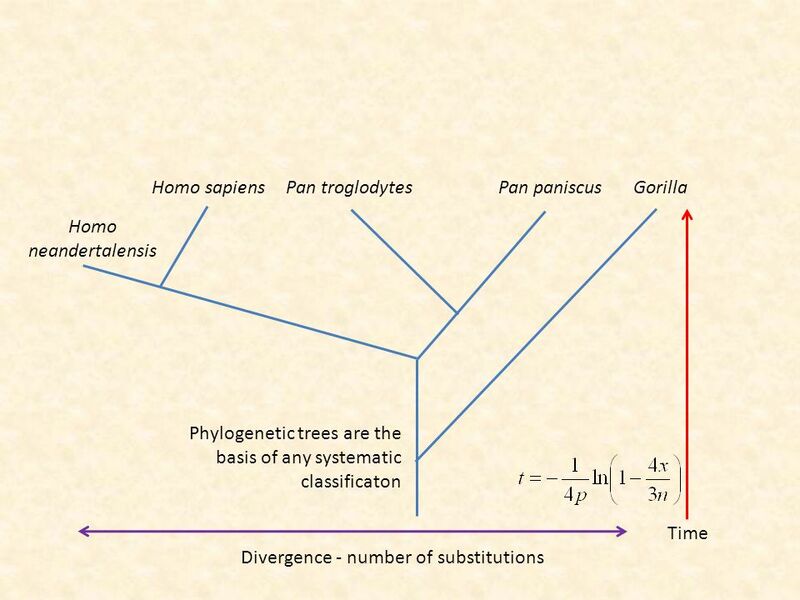 Assume further that at each generation a strain mutates to another strain with probabilities a i →j. The probability to stay is therefore 1-Σa i →j. 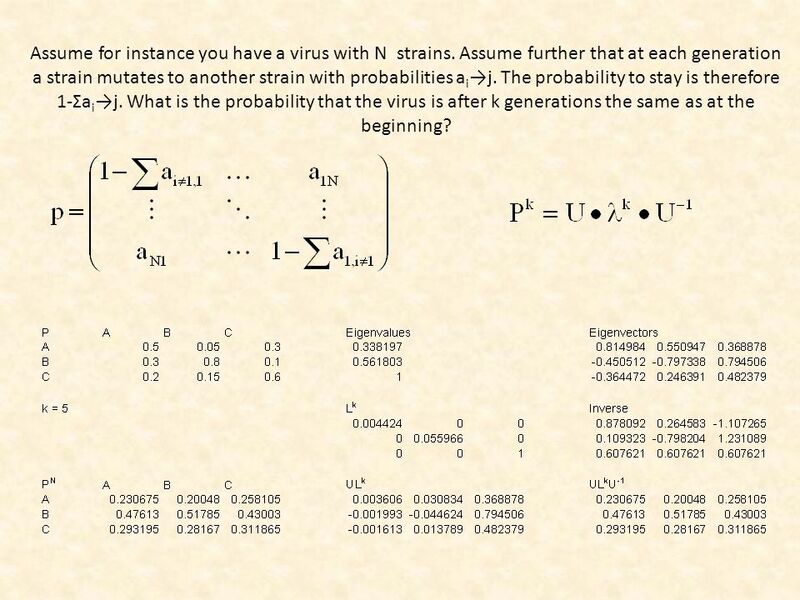 What is the probability that the virus is after k generations the same as at the beginning? 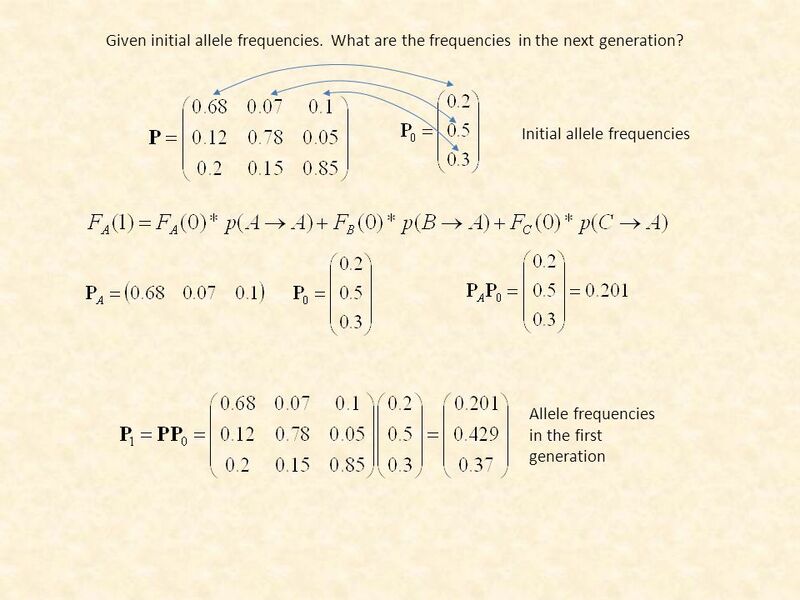 4 Initial allele frequencies Allele frequencies in the first generation Given initial allele frequencies. What are the frequencies in the next generation? 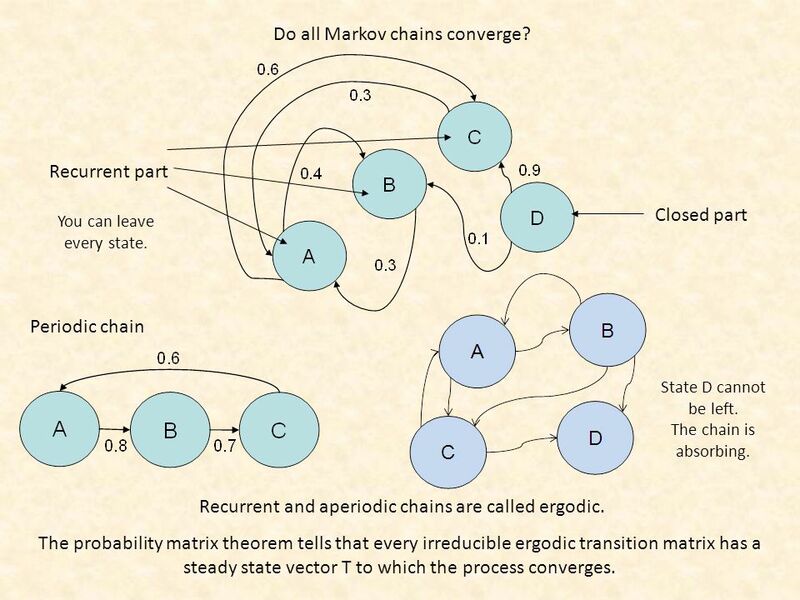 5 A Markov chain is a process where step n depends only on the transition probabilities at step n-1 and the realized values at step n. A Marcov chain doesn’t have a memory. 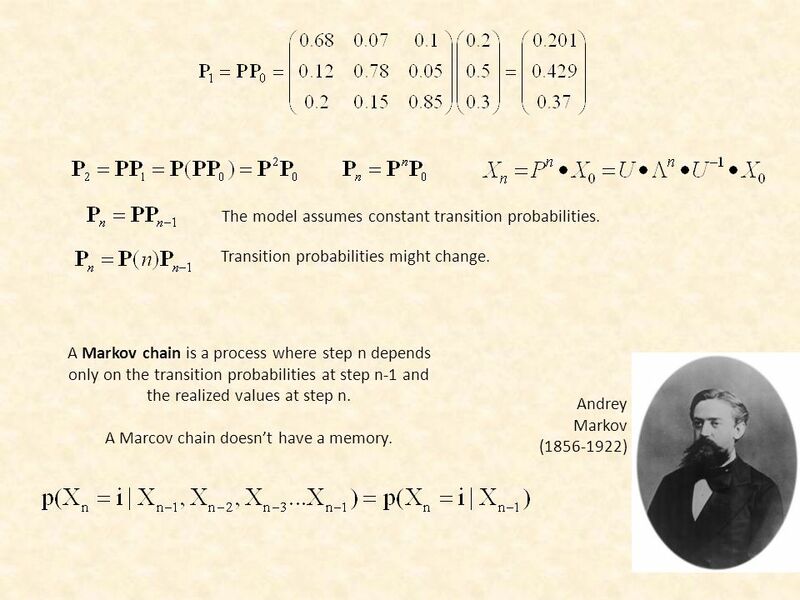 Andrey Markov (1856-1922) Transition probabilities might change. The model assumes constant transition probabilities. 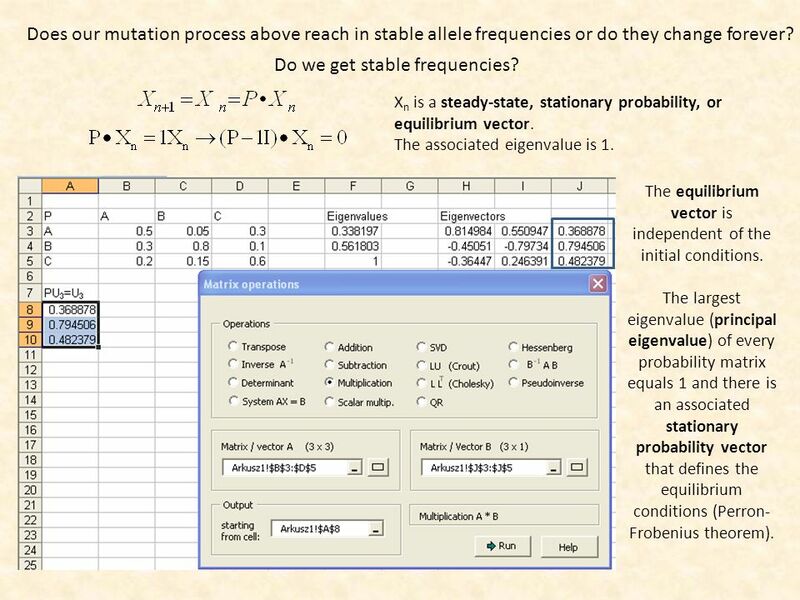 6 Does our mutation process above reach in stable allele frequencies or do they change forever? Do we get stable frequencies? X n is a steady-state, stationary probability, or equilibrium vector. 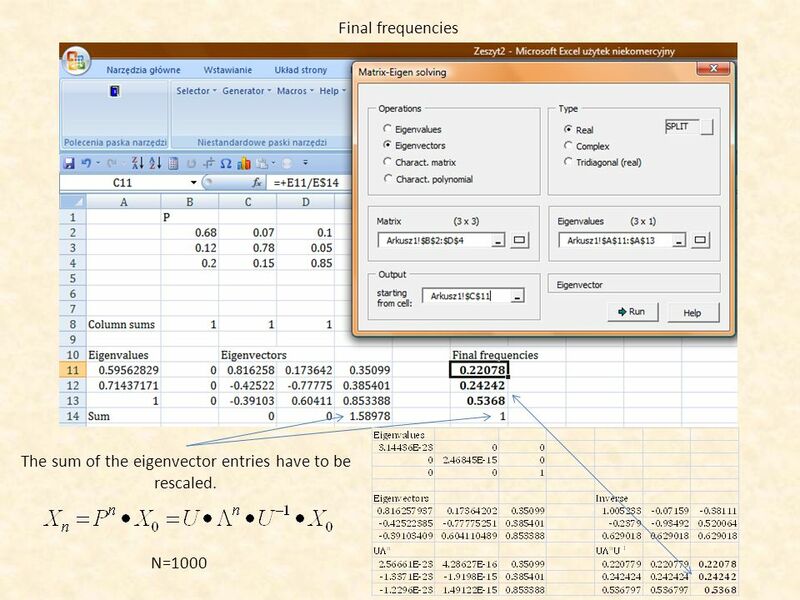 The associated eigenvalue is 1. The equilibrium vector is independent of the initial conditions. The largest eigenvalue (principal eigenvalue) of every probability matrix equals 1 and there is an associated stationary probability vector that defines the equilibrium conditions (Perron- Frobenius theorem). 7 Eigenvalues and eigenvectors of probability matrices Column sums of probability matrices are 1. Row sums might be higher. 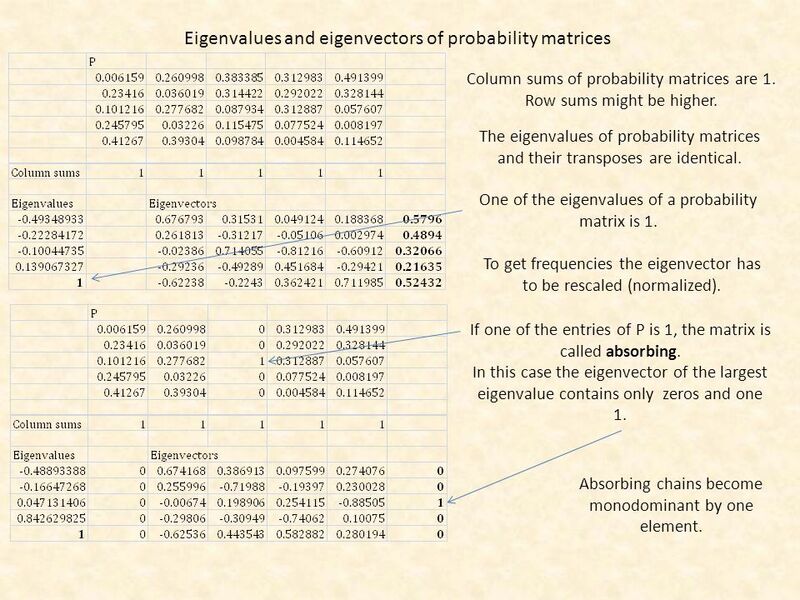 The eigenvalues of probability matrices and their transposes are identical. One of the eigenvalues of a probability matrix is 1. If one of the entries of P is 1, the matrix is called absorbing. In this case the eigenvector of the largest eigenvalue contains only zeros and one 1. Absorbing chains become monodominant by one element. 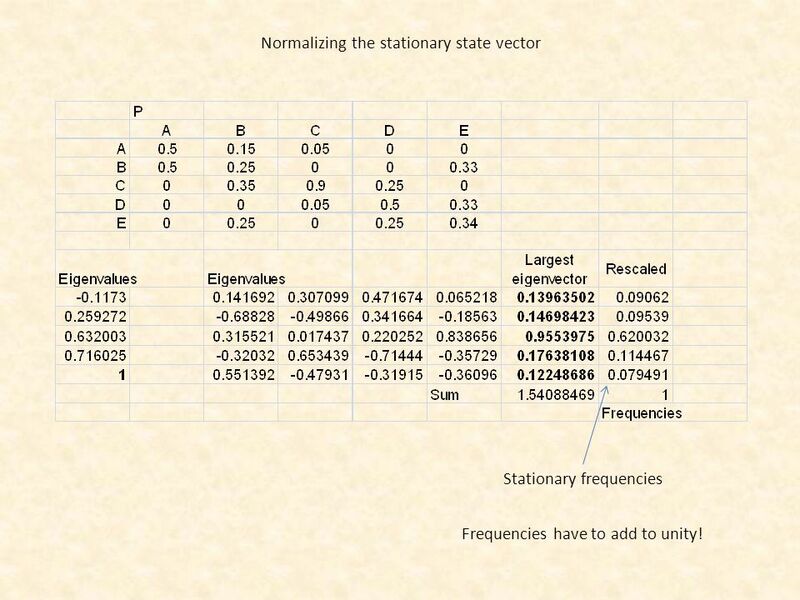 To get frequencies the eigenvector has to be rescaled (normalized). 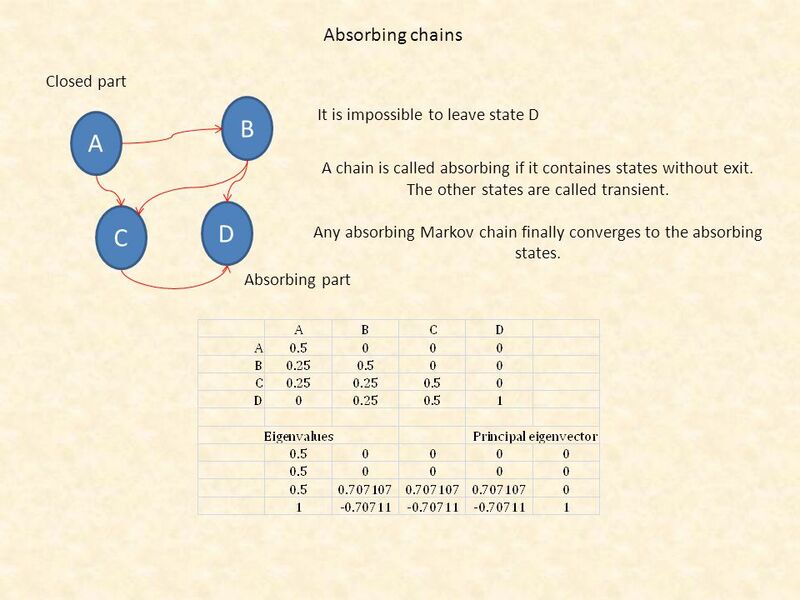 10 Do all Markov chains converge? Closed part Recurrent part Periodic chain Recurrent and aperiodic chains are called ergodic. 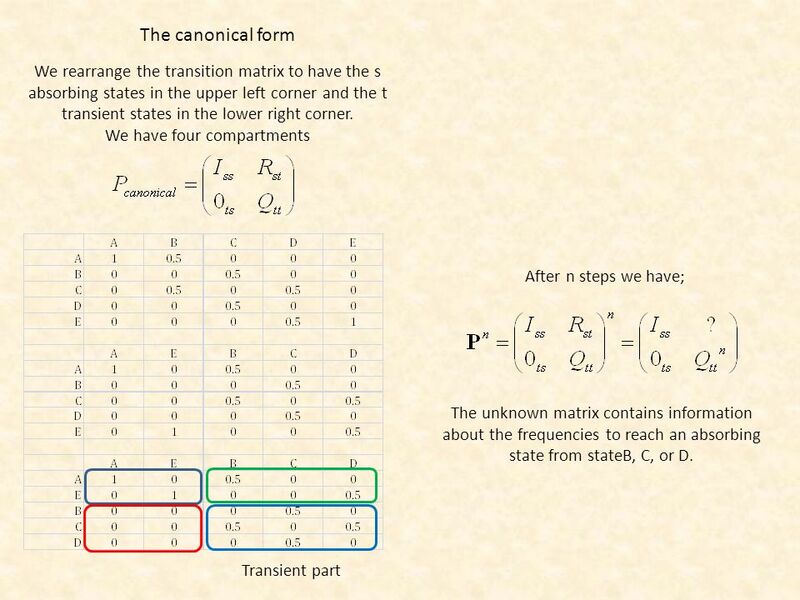 The probability matrix theorem tells that every irreducible ergodic transition matrix has a steady state vector T to which the process converges. You can leave every state. State D cannot be left. The chain is absorbing. 14 Multiplication of probabilities gives ever smaller values Simple geometric series The entries n ij of the matrix B contain the probabilities of ending in an absorbing state i when started in state j. 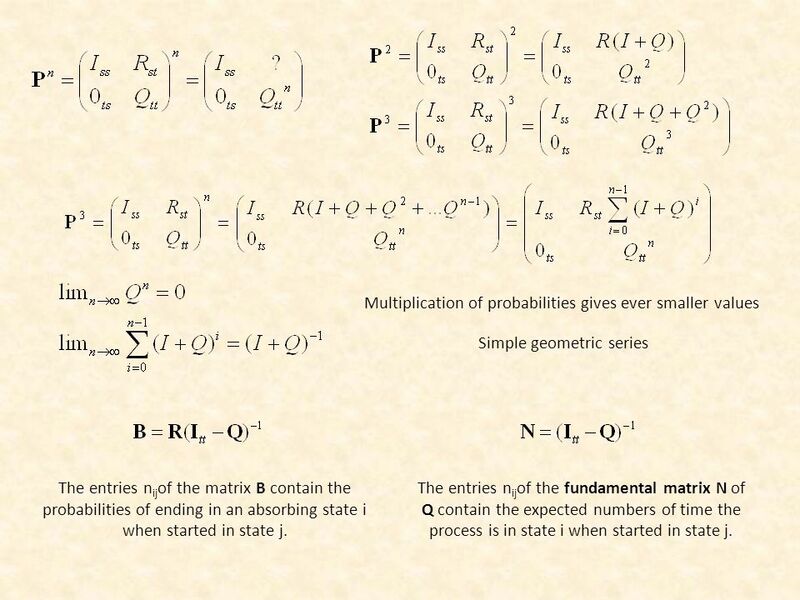 The entries n ij of the fundamental matrix N of Q contain the expected numbers of time the process is in state i when started in state j. 15 The sum of all rows of N gives the expected number of times the chain is is state i (afterwards it falls to the absorbing state). t is a column vector that gives the expected number of steps (starting at state i) before the chain is absorbed. 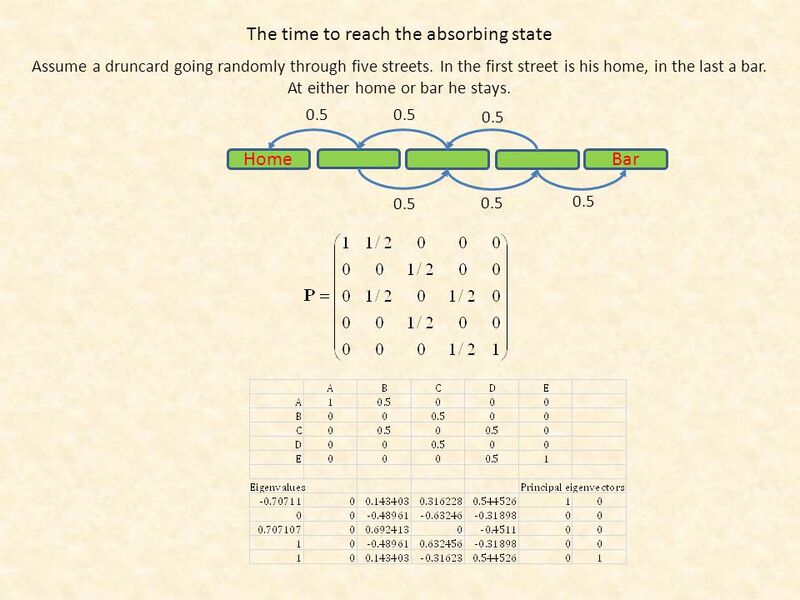 The druncard’s walk The expected number of steps to reach the absorbing state. 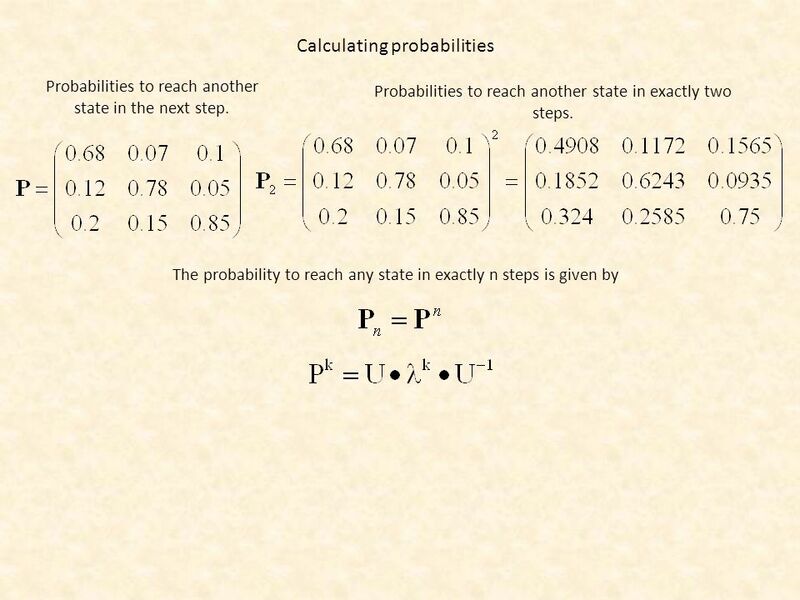 The probability of reaching the absorbing state from any of the transient states. 16 Periodic chains do not have stable points. 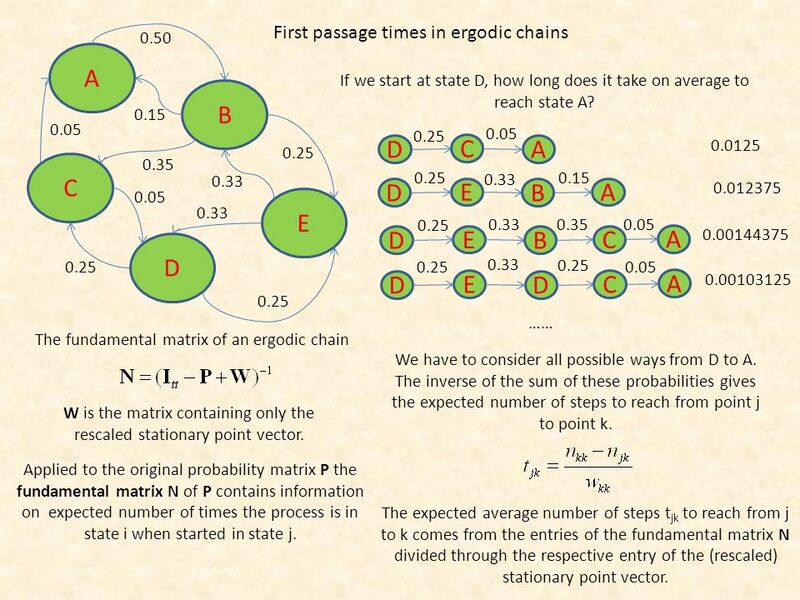 18 First passage times in ergodic chains If we start at state D, how long does it take on average to reach state A? C A D E B 0.33 0.25 0.05 0.15 0.25 0.50 0.35 Applied to the original probability matrix P the fundamental matrix N of P contains information on expected number of times the process is in state i when started in state j. D C A D E B D E B A C A 0.25 0.05 0.25 0.33 0.15 0.25 0.330.350.05 0.0125 0.012375 0.00144375 We have to consider all possible ways from D to A. The inverse of the sum of these probabilities gives the expected number of steps to reach from point j to point k. The fundamental matrix of an ergodic chain D E D C A …… 0.25 0.33 0.25 0.05 0.00103125 W is the matrix containing only the rescaled stationary point vector. The expected average number of steps t jk to reach from j to k comes from the entries of the fundamental matrix N divided through the respective entry of the (rescaled) stationary point vector. 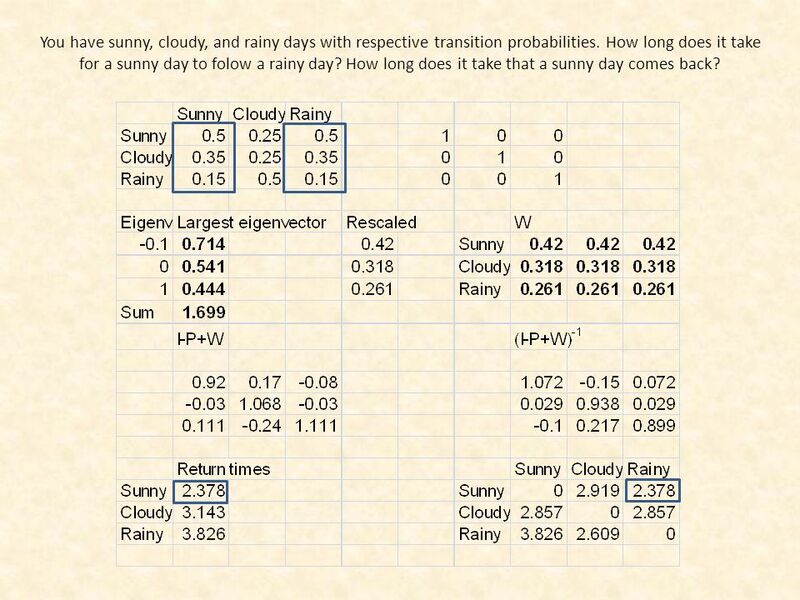 20 You have sunny, cloudy, and rainy days with respective transition probabilities. How long does it take for a sunny day to folow a rainy day? How long does it take that a sunny day comes back? 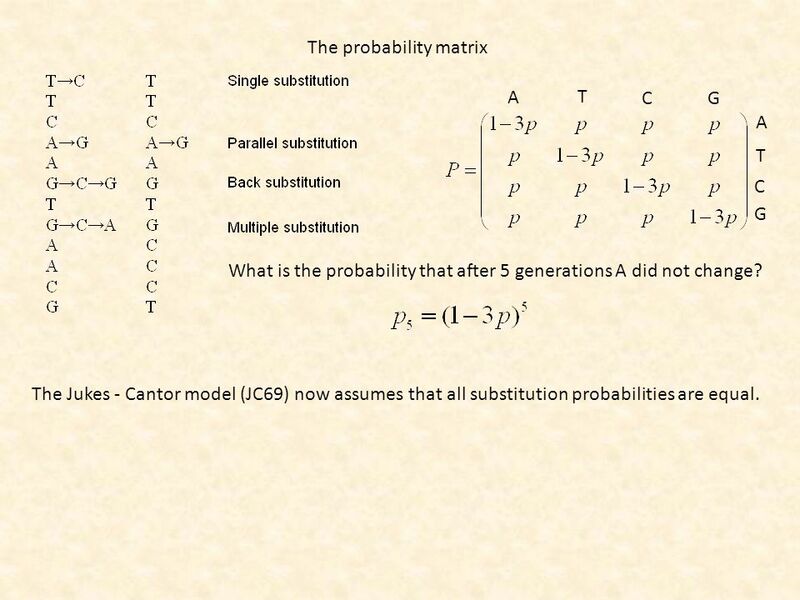 22 The probability matrix A T C G A T C G What is the probability that after 5 generations A did not change? 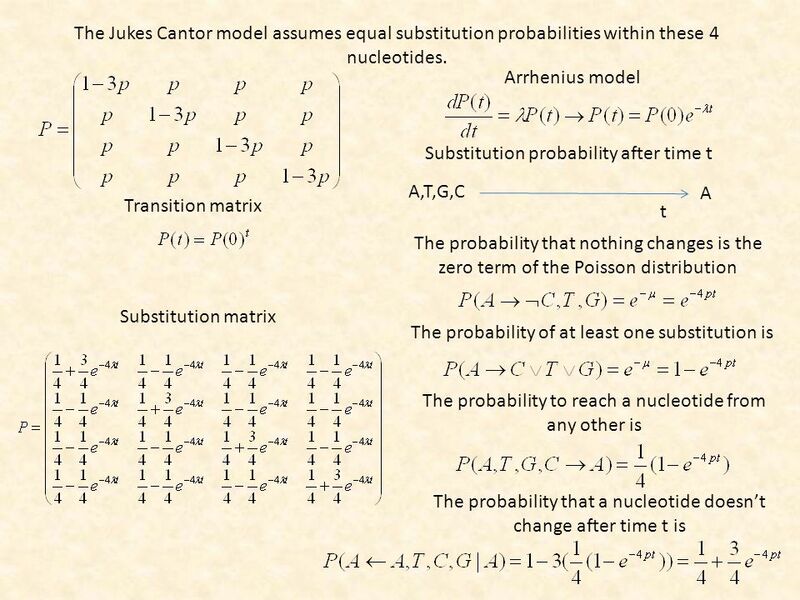 The Jukes - Cantor model (JC69) now assumes that all substitution probabilities are equal. 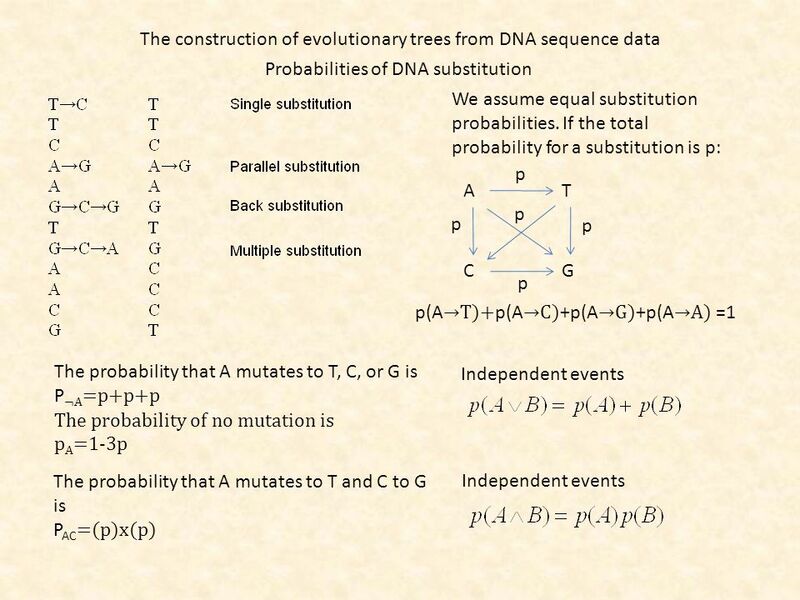 Download ppt "Markov chains Assume a gene that has three alleles A, B, and C. These can mutate into each other. Transition probabilities Transition matrix Probability." Divide-and-Conquer CIS 606 Spring 2010. Markov chains. 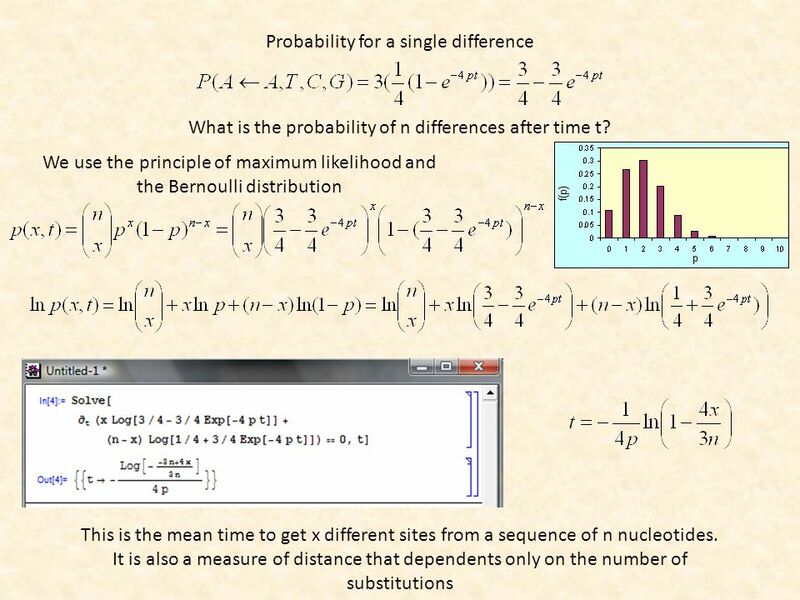 Probability distributions Exercise 1.Use the Matlab function nchoosek(n,k) to implement a generic function BinomialPMF(k,n,p) for calculating. 1 Introduction to Discrete-Time Markov Chain. 2 Motivation  many dependent systems, e.g.,  inventory across periods  state of a machine  customers.
. Markov Chains. 2 Dependencies along the genome In previous classes we assumed every letter in a sequence is sampled randomly from some distribution. Lecture 6  Calculating P n – how do we raise a matrix to the n th power?  Ergodicity in Markov Chains. 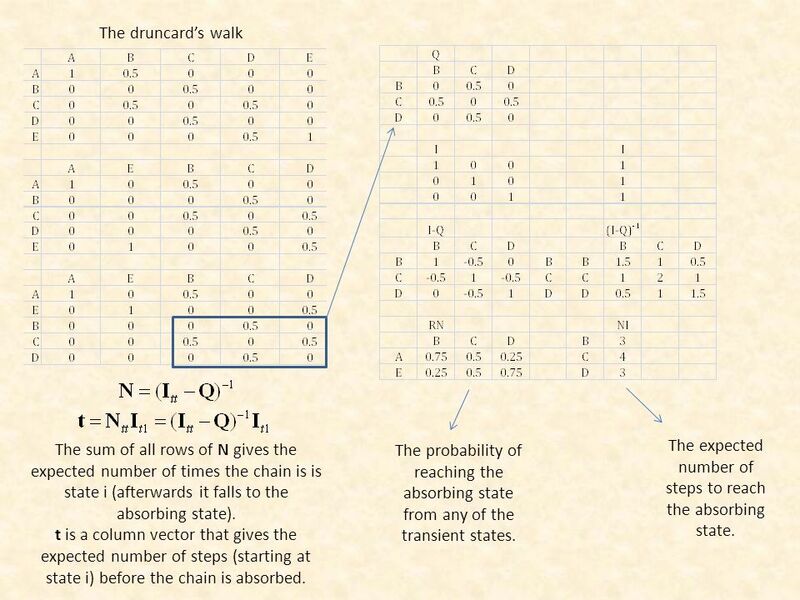  When does a chain have equilibrium probabilities? CS433 Modeling and Simulation Lecture 06 – Part 03 Discrete Markov Chains Dr. Anis Koubâa 12 Apr 2009 Al-Imam Mohammad Ibn Saud University. Lecture 4 The Gauß scheme A linear system of equations Matrix algebra deals essentially with linear linear systems. Multiplicative elements. A non-linear. 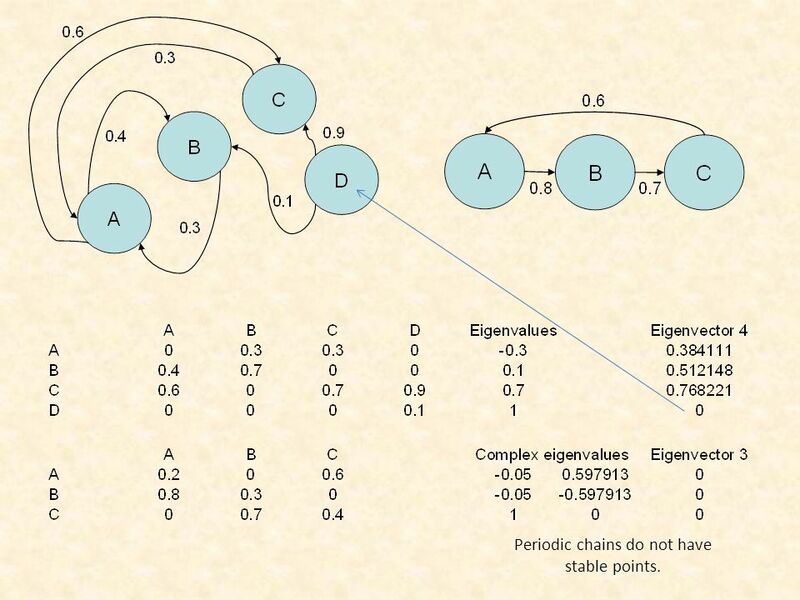 11 - Markov Chains Jim Vallandingham. The Rate of Concentration of the stationary distribution of a Markov Chain on the Homogenous Populations. Boris Mitavskiy and Jonathan Rowe School of Computer. 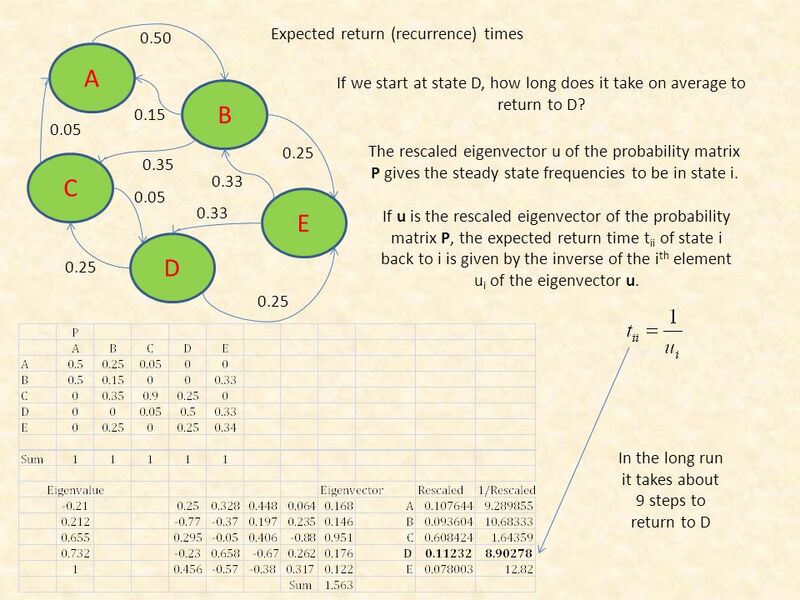 1 Part III Markov Chains & Queueing Systems 10.Discrete-Time Markov Chains 11.Stationary Distributions & Limiting Probabilities 12.State Classification. 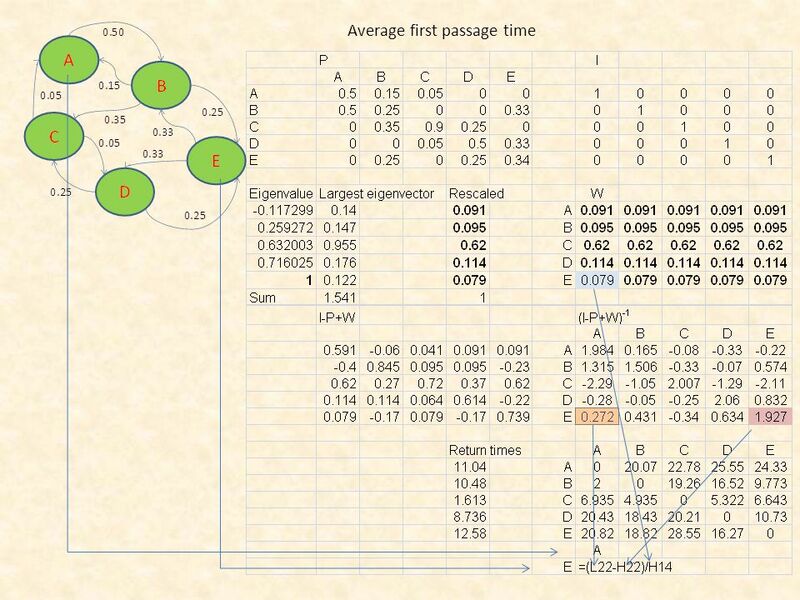 Hidden Markov Models Fundamentals and applications to bioinformatics. Overview of Markov chains David Gleich Purdue University Network & Matrix Computations Computer Science 15 Sept 2011.